We delved into the embroidery world of Marie Berthouloux, Founder of Ekceli, who specialises in designing embroidery on textiles, leather, and furs for luxury and high-end sectors of footwear, handbags, hats, and wedding gowns within the fashion industry. Ekceli is a brand crafted by embroiderer Marie Berthouloux, who designs ‘Textile stories’ to add a sense of emotion to her work. French-born, she gained a degree in Fashion Design and Embroidery, and has always had a passion for the fashion industry, creating and styling garments. Whilst studying, it was clear to her that she would be best suited to specialise in handcraft designs. This was due to her intense passion for working with a variety of different fabrics and textures. After she successfully completed her studies, Berthouloux decided she would like to work with a range of designers, collaborating in a variety of projects to keep her ideas and projects fresh and current. We were lucky enough to catch up with Berthouloux and find out a little more about her, her brand and creative process. I was born in Brittany, in the west of France. After I finished my studies in Fashion Design and Embroidery, I decided to move to Nantes. This dynamic and vibrant town was a base for like-minded designers, who are extremely influential to be surrounded by for inspiration regarding my work. I have always had a passion for fashion and decided from an early age that this was the industry I wished to be a part of. When I started my degree I found an instant connection with handcraft. I really enjoyed working with a variety of fabrics and the textures that were created by my ideas and designs. 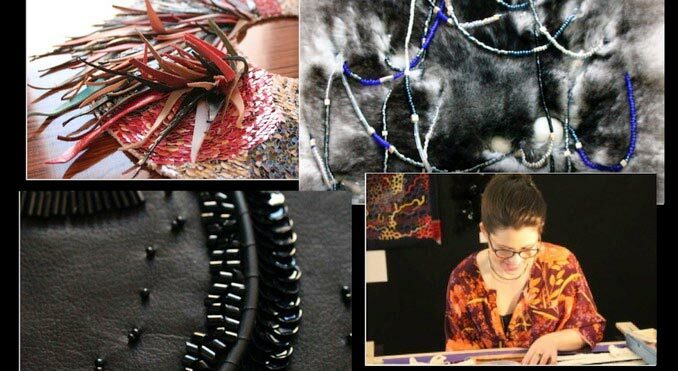 After my studies, I decided to create my own textile finishings, weaving materials, and embroidery independently. Tell us more about your work. I am an independent embroider and fashion designer under my company name of Ekceli. I work alongside designers and brands, and respond to their demands and help bring their vision to life. I work with fashion, accessories, leather goods, furniture, shoes, and art. I create a variety of unique pieces or one-off niche products dependent on my clients’ needs. All of my products are handmade and for luxury and high-end brands. As a craftsman, I naturally enjoy the work itself. I enjoy creating handmade products and connecting with clients to create unique pieces of work, as well as finding answers to complicated requests. I also like to study the change in fashion to keep up to date with the newest designs and collections. The constant change in Fashion is challenging; therefore, I make that my aim to make sure I am in the know. Did you always want to be an embroiderer? I originally wanted to be a stylist. However, I became extremely frustrated because I couldn’t find the right materials and textiles to create my vision. This led me to embroidery. In discovering embroidery, I realised that this technique met my specifications – I was in control of the choice of materials I used and the colours and fabrics I could include in my designs, which helped to bring my vision to life. Take us through an average day for you. Generally, my day is composed of a large part of creation, embroidery and connecting with my clients. I answer my emails and finish my projects and then I follow the news within the realm of fashion and crafts. I share news stories and my ideas across Facebook and Twitter to promote Ekceli across all social media channels. What is your favourite material to work with and why? At this moment in time, my favourite material to work with is leather. This material changes the way I work. Working with leather requires me to think differently, and working around the imperfections or constraints of the material offers a form of natural inspiration. Another two of my favourite materials to work with are silk and linen. These are two very different materials and they open many possibilities of individual designs which include: dyeing, embroidery crochet, lightness and translucency. What has been your favourite collection? I do not necessarily have a favourite collection. I really enjoy a challenge and learning new skills – therefore whatever surprises arise, I take the opportunity to learn from them and solve any problems. I enjoy discovering new processes of designing textures or new materials. However, the collection where I had the most time to develop my ideas was my “Passive Offensive” collection. This was my graduation project where I had eight months to create my finished piece. That was an extremely indulging time that unfortunately doesn’t exist in the professional world. On your profile on our website, it states that you have created luxury and couture collections. Could you give us some examples? My training and experience allow me to respond to one-off and bespoke private clients and designers’ enquiries. For instance, I worked alongside a luxury collection with Kezaly, a tailored wedding dress brand based in Nantes. The bride requested a Duchess satin dress with floral embroidery. The project was implemented gradually as requested by the client over several months. She was delighted with the result. Running a design business alone can be hard and very time-consuming these days. It doesn’t stop with just design, does it? No, it doesn’t. My work has no time limit at the moment because I am still at an early stage of my business. My work does not just stop at the creation side of the brand – I also have to work on the accounting and funding of my company as well as the commercial and social network aspects. I also have to research suppliers and designers to find new customers I can engage with. I love my profession, so I enjoy working a lot and get satisfaction when my designs and collections have been finished. My biggest challenge is currently underway! I cannot tell you anything at this moment in time, however, I would love to be able to tell you all the details when the project is finished. We wish you all the best with it and look forward to hearing more. Once it’s completed, what are your plans for the future? I would like to develop connections with designers abroad and have a variety of different projects underway at the same time. I also would like to develop my technical embroidery skills further to allow me a competitive edge in the industry – my research for that is currently in progress. I would also like to work alongside English designers because I appreciate the great capacities in innovations and eccentricities. I also would like to participate in a variety of UK trade shows as well as the “Première Vision” and “Who’s Next” in Paris. Are you showcasing or attending any exhibitions in the future? From now until September 2014, I am participating in a group exhibition in Normandy, France for the collection: “Sensations Leather”. For more information on Ekceli please visit their profile, website, and blog.